The house has been renovated by the present owners and benefits from double glazed pvc windows, re-wiring, recent kitchen and bathroom. There is further decorating and finishing work to be done. Viewing is recommended. 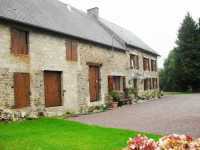 AHIN-SIF-00971 Nr Mortain 50520 Semi-detached house with outbuildings for sale in Normandy with just under half an acre. Possibility of buying additional paddock of 7,150m² and separately owned barn attached to the house to create a detached property. The property is habitable but would benefit from modernisation. Viewing recommended to appreciate the potential of this house. 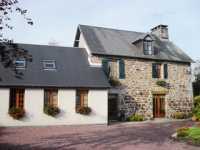 AHIN-SIF-00940 Mortain area Detached rural house with 1,710m² and no neighbours in Normandy and garaging for several cars. Extraland available by separate negotiation. The property has been completely renovated by the current owners and benefits from geothermal central heating, double glazed windows to the front elevation and pvc windows to the rear elevation, all with electric shutters, re-wiring on the ground fl. 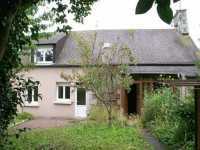 Spacious partially renovated village house with garden and garage with some work to finish. AHIN-SIF-00602 Mortain Area 50520 Country house on the edge of a small village with superb views over the Normandy countryside. Ground floor bedroom and bathroom. Landscaped gardens. This detached house enjoys far-reaching views and has all the convenience of a modern house. The property benefits from double glazed windows and pretty, landscaped gardens. 1190m2 The central heating boiler was replaced in 2014. AHIN-SIF-00961 Juvigny-le-Têrtre 50520 Renovation project with superb views over surrounding countryside. 20 minutes from Avranches. 40 mins BEACHES. Schools and shops on foot. House with garden comprising 2 dwellings. 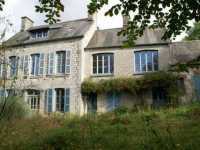 This nice looking property is to renovate… it has 6 bedrooms with garden and outbuildings. Perfect for a big family. A delightful family home located in a tiny hamlet in the country that has been sympathetically renovated to combine character with modern day living. Just 2km from local shops/bar etc., and 10 mins from the nearest town. AHIN-SIF-00953 • Percy • Intriguing 8 Bedroomed Historic Townhouse to ‘finish’ with enclosed garden. Oh 'Yes', be the envy (and talk) of your friends... How wide is your imagination?... 8 Bedrooms?!! This place looks great and so reasonable in price!! Hotel?... Cookery School? Recording Studios? Mmmm? AHIN-SIF-00951 • Sourdeval • Former hotel for sale within a short level walk of all amenities. A hotel running until March 2017 in very good condition throughout. Approximately 500m² of exploitable space including 10 en-suite bedrooms, bar, restaurant, kitchens and reading room/lounge. AHIN-SIF-00952 Pont Farcy 50420 Beautifully appointed country house with pleasant outlook in quiet rural hamlet, within easy reach of the A84 motorway. 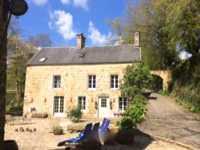 Character stone house in Normandy in quiet rural hamlet • The property has been renovated by the present owners and restored with many quirky, character features. Located in the countryside just a few minutes from the market town of Gavray this stunning family home is approached via a long driveway and is surrounded by its own land, it has no immediate neighbours. 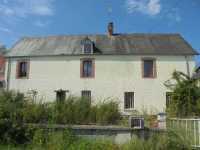 AHIN-SIF-00946 Nr Saint Michel de Montjoie 50670 Detached house with land of one and a half acres and outbuildings. 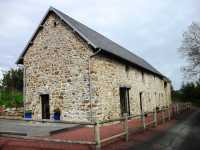 Detached Maison de Maître near Mortain town centre in Normandy within 5 minutes walk of a supermarket. 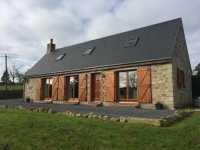 The property offers spacious family accommodation with potential gîte or annexe. Garden. Basement. Outbuilding.